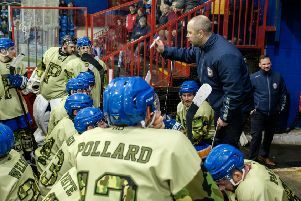 Peterborough Phantoms chief Slava Koulikov hailed the mental strength of his players after ending the regular English Premier League season on a winning note. The city men twice came from behind to pip Guildford Flames 7-6 in a high-scoring thriller at Planet Ice last night (March 19) which was eventually settled by a late Ales Padelek powerplay blast. It might not have been a performance packed with quality from Phantoms, but it one that oozed character arriving just 24 hours after the club experienced EPL Cup final heartbreak. And Koulikov was quick to insist that pocketing two points was important even though the game was rendered somewhat meaningless by Basingstoke’s success against Swindon. It left Phantoms fourth in the final standings and involved in a play-off group against champions Telford, last night’s opponents Guildford and strugglers Sheffield. The chase for end-of-season honours begins when they host the latter side this Wednesday (March 22) – the start of a run of six games in the space off 12 days. “Everyone has to understand what we went through on Saturday night as a club and individuals,” said Koulikov. “Emotions were obviously running high after the disappointment of losing a cup final for the second successive season. “But we had to pick the guys up quickly as we were determined to end the regular season in a good way. They went down twice during the game, but they dug deep and had the spirit to come back to win it. “We went into the night with a chance of finishing third, but Basingstoke’s win meant we stayed in fourth. We have to be pleased with that and we have certainly done a lot better than many people were predicting we would ahead of the season. “We only finished one point behind the reigning champions Basingstoke, we ended up 11 points clear of a big team in Guildford, and 12 points clear of Swindon. “We put the team together with the aim of challenging for two trophies this season and the play-offs is one of them. It’s safe to assume that Koulikov, a man who prides himself on discipline and defensive solidity, will not want a repeat of the high scoreline the regular-season finale against Guildford produced. From Michael Satek’s short-handed opener for the visitors with 4:46 on the clock, to Padelek’s late winner with 2:21 remaining, there was action aplenty. Phantoms trailed for little more than half-a-minute as Tom Norton pounced to level during the same powerplay in which they had fallen behind. Darius Pliskauskas then fizzed in a fine shot out of nothing to edge them ahead before captain James Ferrara found the far corner to earn a two-goal cushion at the end of the opening period. That was halved by Satek’s second of the night as he pounced on a Scott Robson slip, but Pliskauskas and Ferrara soon doubled up in the space of 44 seconds to give Phantoms control. A wonderfully-worked powerplay goal from Tomas Santavuori kept Guildford in contention going into a final session which proved to be the most dramatic of the night as the Flames turned a two-goal deficit into an advantage with a flurry of three goals in the space of three-and-a-half minutes. Kari Sihvonen grabbed the first of them and Satek darted in to level when completing his hat-trick before the visitors hit the front thanks to a piece of good fortune. Danny Meyers’ powerplay blast, which appeared to be heading off-target, clipped the back of Marek Maslonka and nestled in the net. That blow could quite easily have been the signal for a Phantoms collapse, but they rallied to regain the initiative. Defenceman Greg Pick guided his first goal, since returning to the club in January, through traffic to equalise and Padelek then picked his spot on a numerical advantage. That wasn’t the end of the drama as Guildford laid siege to the Phantoms goal for the final 100 seconds after pulling netminder Mike Will, but Koulikov’s men held firm to sign off another regular season of over-achievement in successful fashion. But there is no time to reflect on a marathon campaign as the sprint for play-off silverware begins almost immediately.